Bryan is the county seat of Williams County, Ohio. Originally, Defiance had been the Williams County seat of government, but during the late 1830s, residents decided to move the courthouse to Bryan. 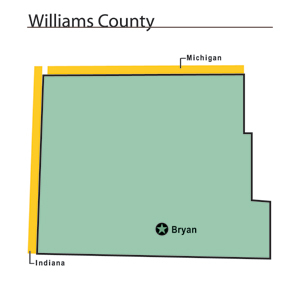 Bryan was created to be the county seat of Williams County in 1840. Residents named the town after John A. Bryan, a former auditor of Ohio and the person who donated the land for the county seat. In 1846, Bryan consisted of only forty dwellings, primarily private homes. Bryan grew quickly during the next several decades. In 1890, 3,068 people inhabited the town. Two years earlier, Bryan contained three newspapers, seven churches, two banks, and several manufacturing businesses, which mainly provided services or products to nearby farmers. In 1888, Bryan's largest employers were the Bryan Plow Company, which made plows, and the Bryan Manufacturing Company, which produced wheelbarrows. Each company employed thirty-two workers apiece.